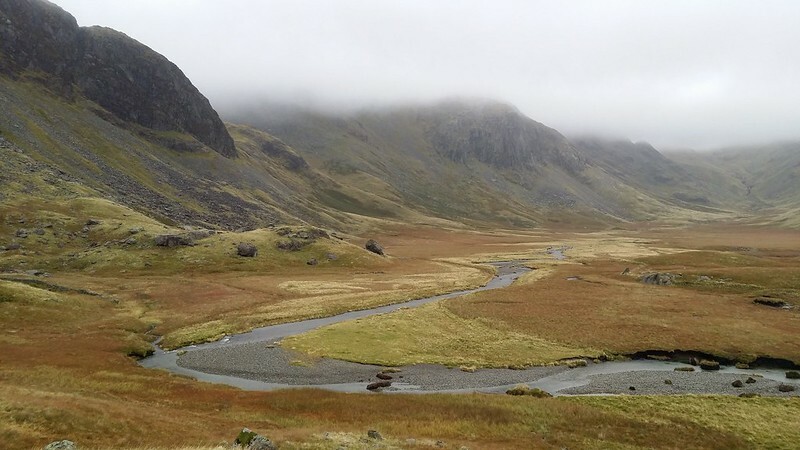 I’d long dreamed of exploring this valley and camping somewhere remote in its upper reaches to enjoy the majesty of England’s highest mountains surrounding me, but the reality was damper, mistier and more precarious than I’d imagined it would be. Never has a jaunt to the Lake District gone through so many iterations of route planning. I was looking at doing a 4-5 night backpack in the southern fells, with Cath (@wellycath) joining me for the bit that coincided with the weekend. However, trying to find a route that enabled me to pick off some fells I wanted to revisit, to bag the Seatallan set that I’m missing, visit some new tarns, camp in a couple of specific places, and that would build in visits to pubs that Cath wanted to “research” ultimately proved impossible. 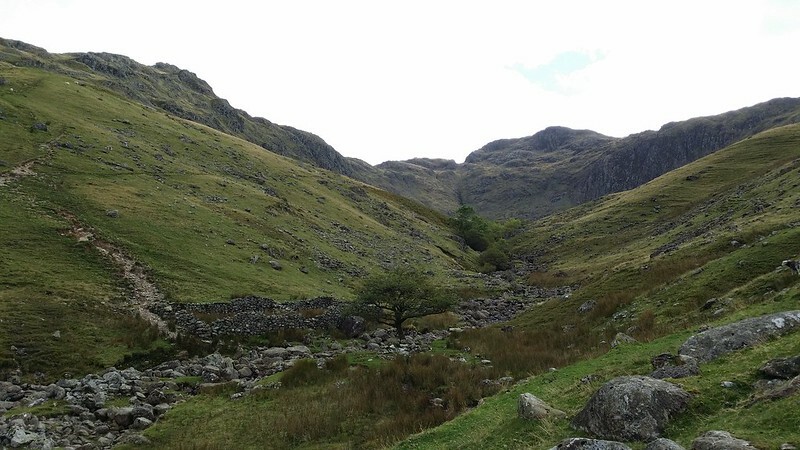 Added to that an additional constraint of meeting Richard (@walkersforumcom) somewhere reasonably convenient to swap cash and an Oookstar, and what I ended up with was a route that was very much about just being out and about in my favourite part of the Lakes. Very little new ground was covered and no improvement to my Wainwright stats achieved. But that doesn’t matter, it was still a good trip. I passed through London on a well-trodden route through crowds of commuters, braving what the station announcer at Euston Square underground station called “adverse weather conditions”, but which I’m sure used to be called light rain. Some sort of problem near Watford delayed my train considerably, leaving me just 10 minutes to wait for the bus in Penrith, instead of the usual 50. I met Richard and his wife Donna outside Booths in Keswick and we did the shady deal. I just had time to grab some water to see me through to the first usable stream and then I was on the bus out to Seatoller. Sadly Richard couldn’t join me on the first part of the backpack as we’d hoped and originally aimed for. It’s always nice meeting up with new people for a camp, particularly people you’ve talked to for a while on social media. 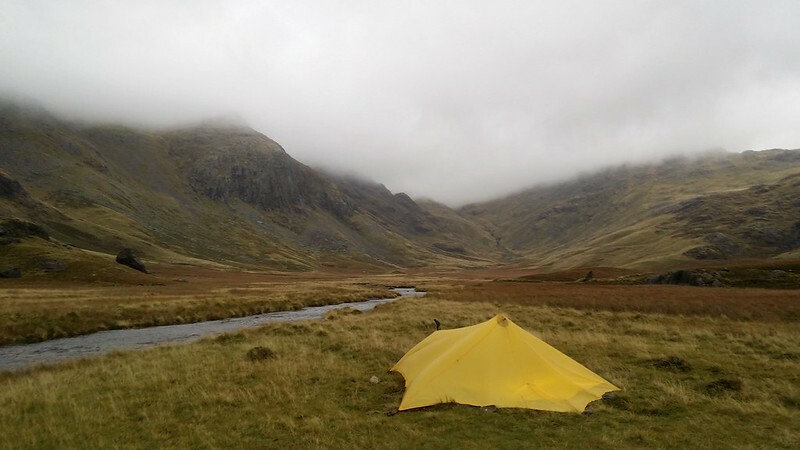 I’d first encountered Richard on the way up to Codale Tarn on my first wild camp in May 2012, and here I was on my way to another first – my first time out with the Trailstar. In a way though, it was handy that he wouldn’t be there to see me fannying about with a new shelter and most likely messing it up. After the traditional faff about in the bus shelter at Seatoller, I was on my way and trotting along the road to begin the climb up Thorneythwaite Fell. It was very much in my mind that this would be a tortuous slog, as the descent of it in June on the 10-in-10 seemed to go on for ever, and past experience tells me I really toil on the first afternoon’s walk upwards. So I was pleasantly surprised that it wasn’t as bad as I’d imagined, and with regular stops to look back down Borrowdale to Skiddaw rising above Derwentwater, I barely felt the effort. It helped that I managed to stay on the path this time. Combe Head rose up on the left and I was briefly tempted to climb up, but I was on a bit of a schedule in order to make my planned camp spot and to have a bit of time in hand in case it wasn’t any good. So I carried on, arriving below the final rocky cap of Glaramara, and automatically slanting around to the right for the easy way up. I’ve done the scramble before, so felt no need to “prove myself” this time. 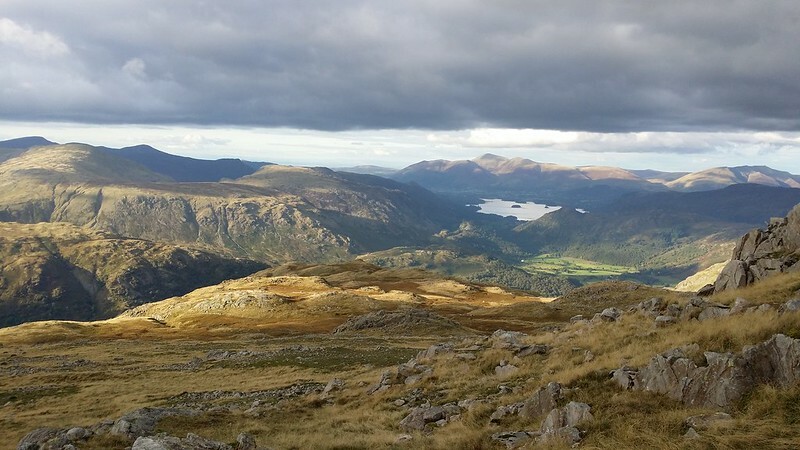 I spent a few moments on the summit, enjoying the views down Borrowdale and ahead to the main play area for this trip. The sun was starting to get low and to silhouette the big boys of the southern fells against the sky: a reminder if I needed one that I was running out of day and ought to be thinking about getting pitched. I headed along the ridge, over Looking Steads and Red Beck Top and found the first of the proper tarns. This wasn’t quite where I wanted to pitch, but I spent a few moments sussing it out anyway. Then on I went. 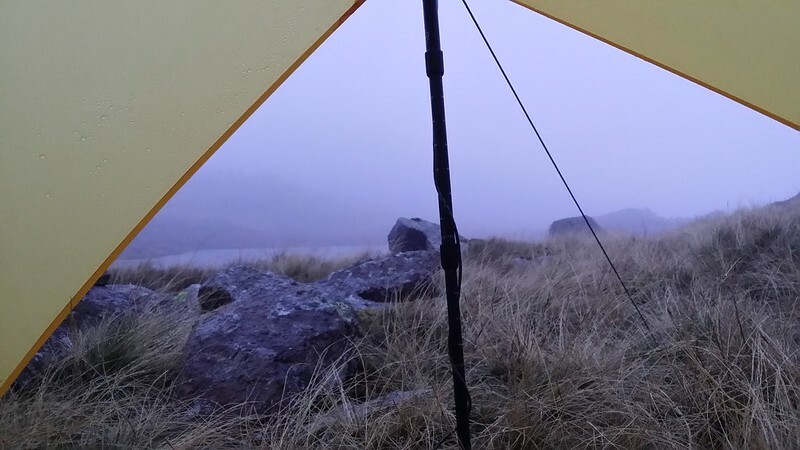 Lincomb Tarns were investigated next but I didn’t find what I was looking for – a pitch to the west of the tarns that would give me a view over them and some shelter from the weather that was due to roll in overnight. 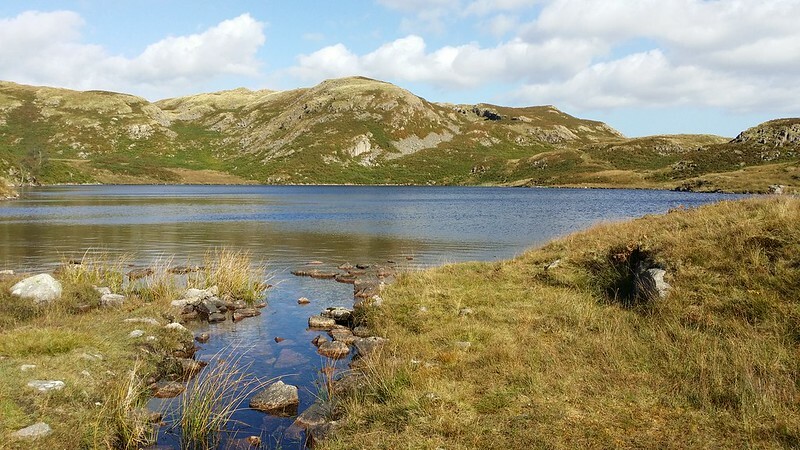 I found a backup pitch I could use by sacrificing the view if I got desperate but focused my energies now on my main target – High House Tarn. I had a good look around and eventually found an acceptable spot that gave me all the things I was looking for, but at the cost of a slight slope and some scattered rocks. I got the Trailstar up no problem and in the rapidly diminishing light hooked the Oookstar to the wrong pegs – so just left it there and used it as a groundsheet for tonight. I’d always planned to bivvy bag the first night anyway and putting the Oookstar up was just to see how it went in and how it looked. I clambered up onto High House Tarn Top to see if there was a worthwhile sunset – there wasn’t, but I did get some rays of sunlight shining on rocks. In fact that’s all I seem to get whenever I camp on this ridge. Dinner beckoned, and a Fuizion Chicken Jalfrezi it was. It was ok – not one of their star meals, but not one of the worst either. A mug of tea and a dent was made in the half kilo of chocolate chip digestives I had brought with me. I settled down to sleep. I didn’t get much though – a combination of the rising wind, sleeping in a new shelter and simply not being in a bed put paid to that. One advantage of a Trailstar is that not having a door, it takes very little effort to look out and see what it’s like outside. It didn’t look particularly inspiring on this occasion. While I was having breakfast I saw the light misty drizzle settling on the shelter and could sense that once I was out of my sheltered spot I’d be experiencing some wind. But this was pretty much as forecast – I just had to survive today and then things would get better for the rest of the trip. I didn’t hurry. I had no desire to be out in the wet any longer than I needed to be, and it was highly unlikely that anyone would be along for quite some time. 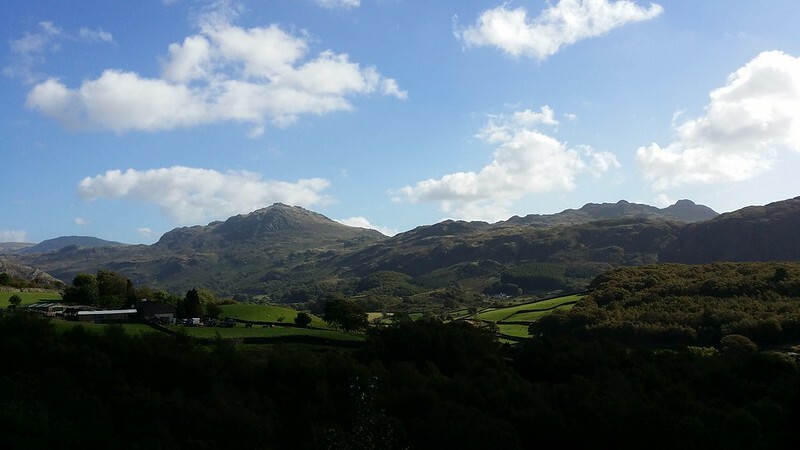 I’d already decided that if the wind was bad, it was really wet and I couldn’t see much that I’d scrap my planned route over Scafell Pike and Scafell and simply drop straight down into Eskdale from Esk Hause. And so it proved to be. In under 5 minutes of walking as I climbed up over Allen Crags, I knew that my foul weather alternative was the way to go. This wasn’t a bad thing as it would give me a chance to explore upper Eskdale as I’d never ventured beyond the end of Hard Knott before. I reached Esk Hause in mist and driving rain and had no hesitation in searching for the path down into Eskdale, finding just enough cairns and signs of previous feet to guide me through the grass to the top of the gorge. I took it easy clambering down the gorge of the infant Esk, switching from bank to bank to find the best footing and bits of actual path. Above me mist swirled and it was impossible to make out any of the tops – a good decision to stay off them. I was relatively sheltered where I was and was happy to stay that way. The course of the Esk flattened out a bit as I passed the last protruding bits of Scafell Pike on my right and I could see the valley stretching out in front of me for miles. With no sign of the weather clearing at all today, and my planned camp on Great How no longer practical, my mind started to germinate the seed of an idea – stopping early. I got to Sampson’s Stones and had a good explore of them for some shelter – I found plenty but only on sloping ground. So I moved on and eventually spied a patch of flat grass in a bend of the Esk that would do nicely. Some care taken to cross the raging Esk and then I was assessing whether the pitch would do. It would do fine, I concluded. I was out of the worst of the westerly wind, but would cop it more if and when it turned southerly. That was fine – nothing was forecast that the shelter shouldn’t be able to handle. I got the Trailstar up, this time with the Oookstar attached to the right pegs. Precautionary rocks were placed on most of the guys, especially as the ground was really hard and getting the pegs in really deep was tricky. I settled in for an afternoon “in”. I heard a couple pass around 1:30 but other than that there was no one about, and I had a quiet afternoon in the Trailstar. Actually this proved to be a good test of the “liveability” of the shelter – there’s nothing like an extended period of non-sleeping time in a shelter to get used to it and how it works for you. I enjoyed the amount of room, and the fact that I could lie stretched out without even being in the inner. The low headroom was starting to irritate me though – whenever I moved about under the Trailstar I kept brushing against the fly, and in order to be comfortable I needed to manoeuvre so that my head was under the apex. While I was looking up, I also noticed a small tear in the fly close to the seam in one of the “front” panels. I don’t recall seeing it when I pitched it in the garden after I got it, but neither did I think I’d been so clumsy that I’d ripped it on the first night. Either way a repair was going to be needed when I got home. I was also seeing a lot more moisture on the inside of the fly than I’d expected. Some of this was clearly condensation, but it couldn’t all be and I made a note that I’d do a precautionary seam seal when I got home too. 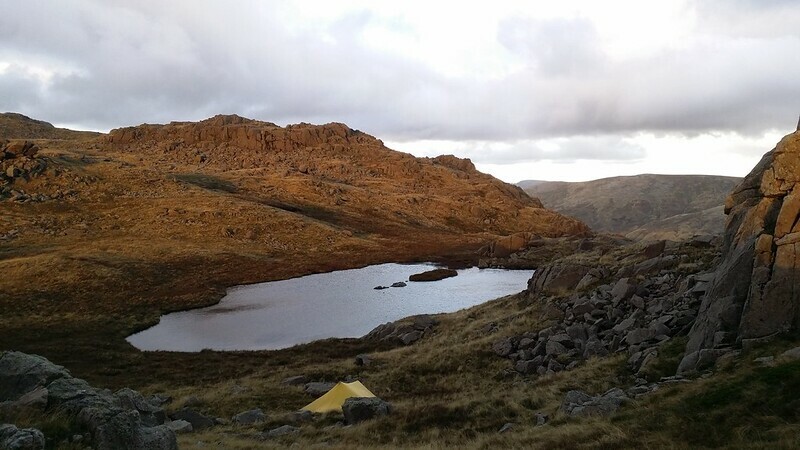 I lazed in the Trailstar, sallying forth only to attend to the needs of nature, and otherwise enjoying what there was to be had of the view of upper Eskdale. 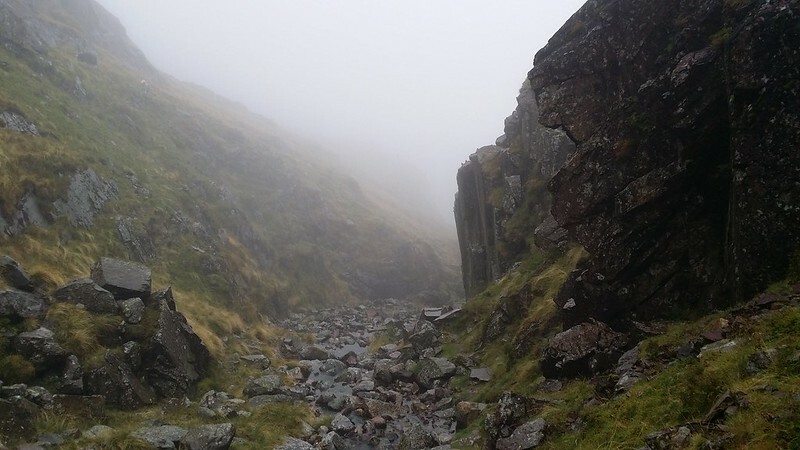 I’d long dreamed of exploring this valley and camping somewhere remote in its upper reaches to enjoy the majesty of England’s highest mountains surrounding me, but the reality was damper, mistier and more precarious than I’d imagined it would be. On one of my trips outside I noticed that the Esk seemed to have got noticeably higher in a mere two hours since I had crossed it. Worries that it would burst its banks and flood me out started to germinate and accompanied me throughout the rest of the afternoon and night. I ate another Fuizion (Thai Green Chicken Curry) which I didn’t enjoy at all and seriously depleted my stores of biscuits and chocolate – to the extent that a top up was going to be needed asap. An early night at only 7pm and I slept fitfully, but a little better in the Oookstar than I had in the bivvy bag. I kept waking and trying to discern whether the Esk was creeping towards me. A nocturnal comfort break outside gave me the opportunity to conduct a more scientific study, but it was too dark to really judge – all there was below me was a twisting and surging mass of dark liquid. It still seemed a way below the top of its trench though and didn’t seem any higher than last time I looked. I told myself it would be fine and went back to bed. The rain eased in the early hours and was replaced by the wind. By 7:30 this had risen to such a point that it was testing how well I’d anchored the Trailstar. Some serious battering and I felt the fly constricting the headroom in the nest further. I endured it as long as I could and started thinking about getting up, being forced to do it when the wind won a small victory. One of the front side pegs came out of the ground and thrashed about in the angry tempest. The only one that I hadn’t put a rock on too. Luckily for the shelter, the peg came off the guy and was flung away rather than clawing at the fabric of the fly. But with an end free, the strain on that panel grew and I saw the existing small tear widen. I got up and ready to go pretty quick. My walk out started with the conundrum of how to cross the now-swollen Esk safely and without getting any wetter than I needed to. I headed back upstream until I found somewhere that had some rocks I could use to help keep feet dry, but ended up splashing across anyway – I might as well have just waded the Esk from where I camped. With almost a whole day to fill before I met Cath at Eskdale Green, I toyed with the idea of climbing up onto Great How and picking up the route I would have done today if I’d stayed high yesterday. I never quite got to the point of feeling like actually doing it, and was content to just make my way down the valley while the remnants of yesterday’s weather dissipated. So I simply followed the path down to Taw House. On the way I spotted a group of tents pitched at foot of the ridge that rises to Esk Pike and I bet they had a windy night too. They disappeared behind me and I started enjoying the gentle walkout down the valley, the weather improving almost with each step. Patches of blue became great swathes of blue and clouds retreated. 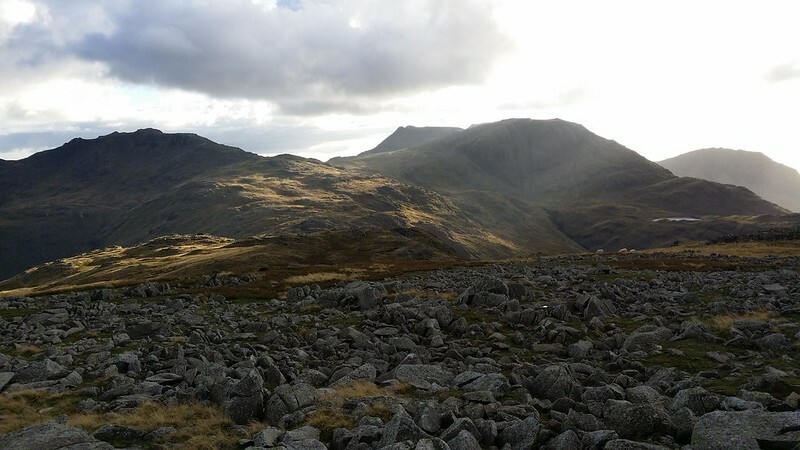 Favourite fells Hard Knott, Harter Fell and Green Crag came into sharper view. I met farmland and had some fun crossing the field boundaries – in particular one gate that had a chest-height bar the other side that was difficult to negotiate with a large backpack on, and which made closing the gate difficult. Every trip seems to have one moment when I find myself throwing curses to farmers into the ether. I found myself soon at the Woolpack Inn and dived inside for something to eat. Even though it was only 11:30, my sausage, egg and chips was washed down with a pint of ale. A patchy wifi and similarly sparse 3G signal allowed me to catch up with the world in general, but more particularly to see if there were any messages from Cath, who I was due to meet in a few hours. 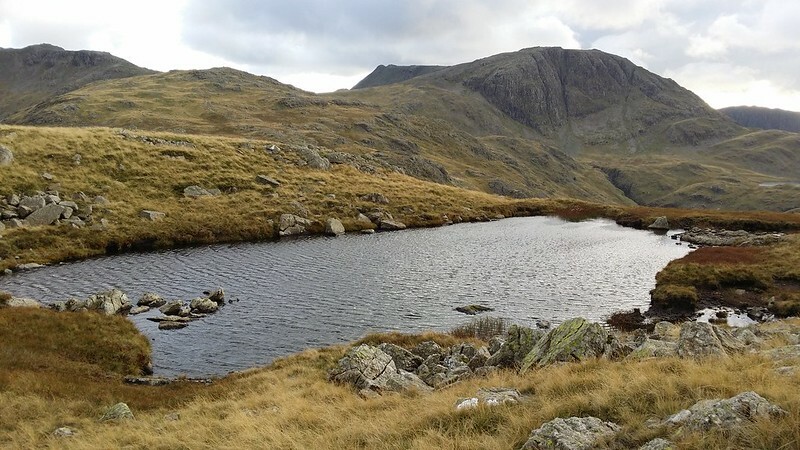 With time to kill before meeting Cath, I arrived in Boot and decided to have a brief foray onto the fells to check out some tarns I’d been meaning to visit. I took the path up onto Eskdale Moor and spent a few moments looking at the ruined peat huts before slanting off to the left for the tarns. A path that seemed a lot longer than on the map wound me amongst outcrops and brought me to a point where it started going back up. I clambered up onto the adjacent outcrop which turned out to be Bleatarn Hill) and found myself looking directly down onto Blea Tarn and with Siney Tarn and Blind Tarn in the distance. I inched my way down the steep side of the hill to rejoin the path down to the tarn. Much time was spent investigating the tarn for potential camp spots, none of which were that great, especially for something with a huge footprint like the Trailstar. More time was spent simply enjoying the tarn. 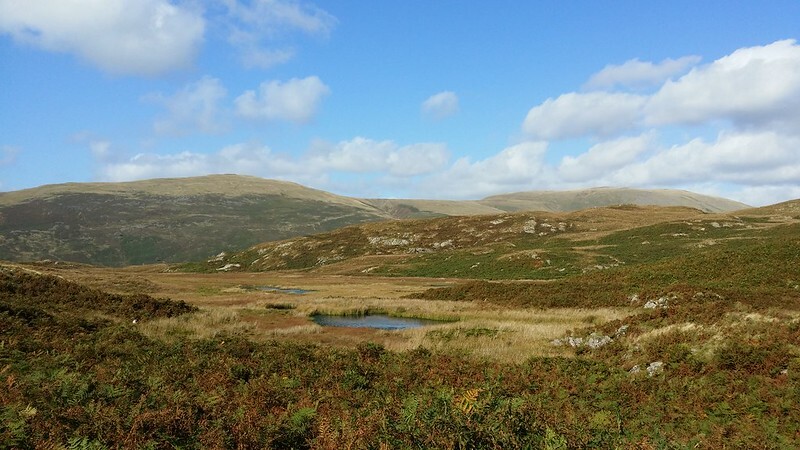 I followed the path that should take me to the other tarns, but somewhere along the way went too far left and found myself following the wall across the fell rather than passing the tarns – which were now to my right rather than my left. With time advancing, I decided not to detour to visit them and contented myself with simply looking at them from a distance. I’d done the principal and best one anyway. 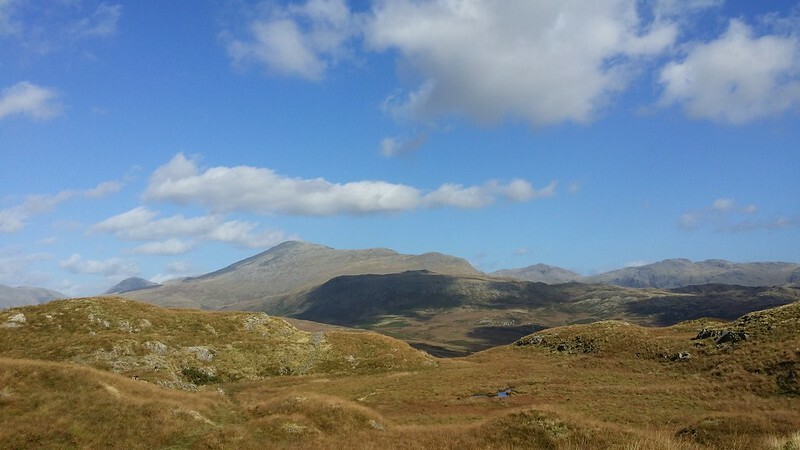 An undulating course across the top of the battlements of Eskdale Moor brought me to just above Eskdale Green and I descended with a quarter of an hour or so until Cath was due. Exchanges of text messages changed the rendezvous from the station to the pub, so I adjourned to the King George IV to wait it out.